The Cornilleau Sport One Outdoor table tennis table is a superb table that you can set it up at the backyard of your house. It is superb since it is an excellent way for you to have a healthy activity going in your house with your kids. And it is definitely a pleasurable way of spending your time and energy outside the house in the fresh atmosphere. This outdoor table that produced by Cornilleau can say to be a new technology product that you can buy in today. Cornilleau managed to make an absolutely innovative ping pong table by their keep improving technology. The Cornilleau Sport One ping pong table features with a compact folding mechanism which is specially designed for easy fold and unfold plus safely. If one of your hands is occupied with something, you will have no issue to open the table even with just one hand. This ping pong table includes polyethylene net and ABS net posts that been mounted and incorporated into the carriage. You can also find convenient balls holders constructed into the middle part of the body of table tennis table. Warranty: 3 years (10 years on surface). The Cornilleau Sport One table is without a doubt an outstanding beginner table which provides a great playing level. The table is features with leg-levellers and bat storage which can be very useful for players. In addition, It is weather-proofing in which it can withstand with any weather condition without having any damage to the table. If you purchase this table, you not only receive the table but you will at the same time get some ping pong bats, balls and a cover. You can then having fun with this recreational ping pong table outdoors with your family and friends. There are still more benefits you can expect from this Cornilleau Sport One Outdoor table tennis table. 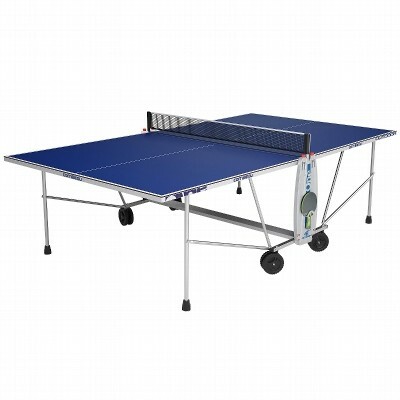 You can get a decent thick playing table top which provides you a great ball bouncing, an anti-glare surface, more robust legs and superior wheels for easy movement. All in all, it is recommended for you to buy this table tennis table if you’re searching for a good quality table to place outdoor. You can get this table with affordable price since this table won’t cost you more than a $1000. It is a fantastic table which also incorporates a playback facility which enables for single player use. yes, i know who he is, and of his condition, and of paalyrmpic table tennis (one of the first people﻿ i played with regularly was in a wheelchair). tahl leibovitz is not a world class player, by any stretch, although he is quite good. his current usatt rating is 2391, putting him just out of the top-100. the best people in the usa are around 2700, and they aren’t even in the top-700 in the world. the fact remains, it would be more reasonable to use someone with great form for a video like this.